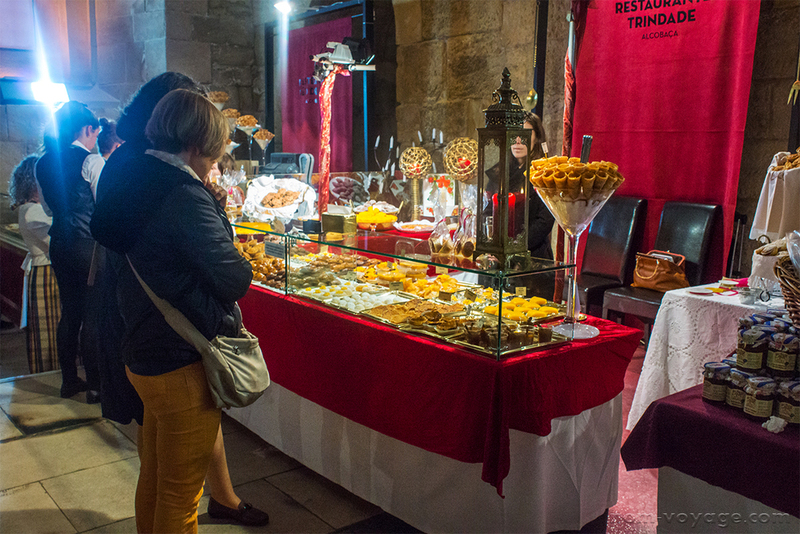 Mostra Internacional de Doces e Licores Conventuais in the Mosteiro de Alcobaça — Nom Voyage! Last November a friend reminded me that the annual Mostra Internacional de Doces e Licores Conventuais was going to held again inside the monastery of Alcobaça, so we made plans to drive down there and sample some of the treats. For those that don't speak Portuguese - this is a festival dedicated to conventual desserts and alcohol. While not every pastry, candy, or liquor is currently being made by nuns or monks, all of the recipes supposedly originated in a convent or monastery. While the delicious treats on display were mainly Portuguese; Spain, France, and Belgium also represented with a number of their own tasty sweets and drinks. The Mosteiro (or Monastery) of Alcobaça is located in the town of the same name, about 1.5 hours from either Lisboa or Coimbra by car and easily accessible by train or bus. It is one of the more popular Portuguese monasteries, known for being the final resting place of Portugal's most famous star crossed lovers, Pedro and Inês. When Pedro was crown prince to the throne, his family decided his relationship with Inês was unacceptable because she wasn't of noble birth and had her murdered in Coimbra. Years later, when Pedro ascended the throne, he had her killers assassinated and exhumed her body, placing it in a throne and forcing the entire court to swear allegiance to her as the Queen of Portugal. Many of Portugal's famous pastry and dessert recipes originate in convents because the nuns had many leftover egg yolks after using the whites to starch their uniforms. Also, in 1834, after the Portuguese Civil War, the king suppressed all religious orders and confiscated much of their property. In need of money to support themselves they created pastry recipes made mostly from egg yolks and sugar which continue to be sold today. Ginja, or ginjinha, is a sweet liquor made from tart cherries. Pão de Ló: Portuguese sponge cake. There are two varieties; one is moist and sometimes liquidy on the inside like a lava cake and the other is firmer and drier, more like a traditional American spongecake. Pasteis de Feijão: bean pastries, vaguely reminiscent of some Japanese azuki bean desserts. Bolo Rei is pretty similar to New Orleans' King's Cakes and is commonly seen during Christmas and Easter. Usually round, they can actually be any size and shape and tend to have a sweet roll-like texture, with candied fruit, and nuts. Sweet eggy puddings that shall remain nameless. These won a Best in Show award. I'm going to have to admit they weren't my favorite and were more sugary than anything else. The Trippel from Herkenrode Abbey in Belgium. The festival took place right after the terrorist attacks in France, so the monastery was lit up at night with the colors of the French flag.